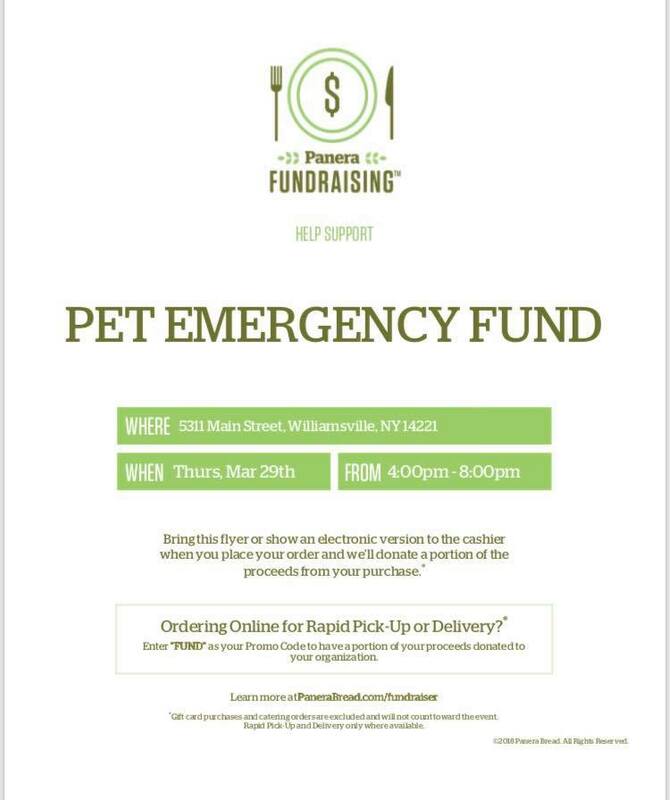 Donation for every dine-in or pick-up order showing the below flyer. 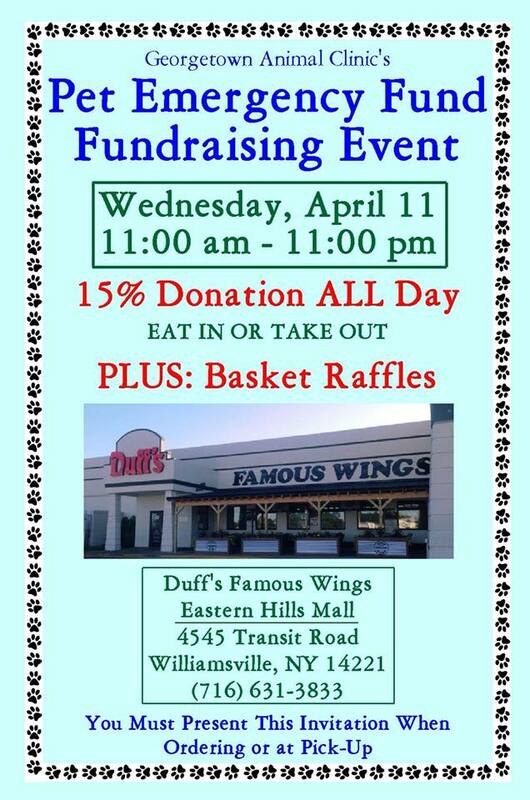 15% donation for every dine-in or pick-up order showing the below flyer. Rico, an 8 year old Pomeranian-Chihuahua mix, started showing signs of great discomfort one day. He was diagnosed with dental disease and needed to have eight teeth extracted immediately in order to relieve the pain and stop the infection. The cost of the extensive dental procedure was estimated at $1500-2000, which Rico's owners didn't have because of recent employment changes in their family. The vet staff used their Pet Emergency Fund account so that Rico's owners only had to pay $500, which was the most that they could afford. Rico had the dental surgery, recovered well and lived happily ever after! PEF Selected as Lowe's Employee Give-Back Time Recipient! PEF is honored to be selected as a recipient of Lowe's Store #1883 employee give-back time! One of PEF's 2018 goals is to increase awareness about the organization among pet owners in Erie and Niagara counties by working in conjunction with other pet-related groups, including rescues and dog parks. In keeping with that goal, PEF's proposal for the use of the Lowe's employee give-back time is build benches that will be inscribed with PEF contact information. The benches will then be donated on behalf of PEF to dog parks in Erie and Niagara counties. Stay tuned for updates on this exciting project! Triple Your Donation through Amazon Smile! If you haven't signed up with Amazon Smile yet, now is the time! From March 12-31, Amazon is tripling the Amazon Smile donation rate to 1.5% when customers make their first eligible smile.amazon.com purchase. Not sure how to sign up? Go to smile.amazon.com and enter Niagara Frontier Veterinary Society Pet Emergency Fund Inc. as your charity of choice, Amazon will remember your charity selection for future purchases. Jane has been a Practice Manager at the Blue Cross Animal Hospital since 1992. She lives with her husband Brian, and her four-legged kids: Banana, Gunner and Bazinga Victory. Banana is a shadow to Jane and is cuddly. Gunner was adopted from a rescue group when his owner could no longer care for him. He brings stuffed animals to Jane in bed every morning. Bazinga's middle name is after Brian's motorcycle. Spring is just around the corner! As you get ready for warmer weather and spring holidays, don't forget about your favorite furry or feathered friends! Click here for tips from the ASPCA on springtime pet safety.